Firms in the architecture, engineering and construction (AEC) industry as well as the manufacturing marketplace must need to how to leverage every-changing technology as a competitive marketing advantage. The Internet is changing the way people seek and find information, communicate and collaborate. AEC marketers must develop a strategic approach to social media to amplify and spread their message. Social media presents interesting opportunities for business-to-business firms to engage in authentic dialogue and conversation with customers. Based on community and openness, social media presents an opportunity for participation, dialogue and connections. Key to success is weaving your content and message into the social web, making con­nections with your target audience, communicating in real-time, as well as listening and responding accordingly to these messages. It is important to understand that social media is a function of marketing and it helps support other marketing objectives such as building awareness and branding that can lead to a greater return on marketing investment (ROMI). Further, social media can be a means to create more awareness, more visitors and more revenue. However, social media is not an end in itself. It cannot and should not replace traditional marketing activities. 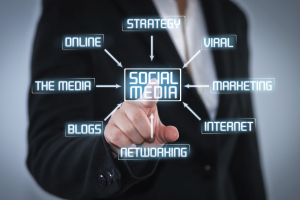 Social media should leverage and augment marketing efforts. To get desired results, AEC firms must understand how emerging technologies can complement and enhance traditional marketing efforts. Traditional marketing methods such as advertising and direct mail focus on outbound marketing. These methods are based on reach, frequency and message. Social media strategies are more about content that is published and the social component of sharing. This translates to inbound marketing and lead generation. To be effective, inbound marketing must enable sharing of interesting and relevant information, content, tools and resources to attract people to your site, while interacting and developing relationships. Ultimately, social media is about content, engagement, dialogue, relationships and monitoring. The social media world has different rules, and community users typically don’t respond to marketing or advertising messages. Strong editorial content that promotes a product or service can be highly valued, whereas overt advertisements are rejected. Authenticity is essential. For business-to-business firms, developing and implementing a social media strategy will take diligence, commitment, creativity, effort and, most important, purpose. Content needs to be consistently created and managed. Since social marketing is a form of viral marketing, interesting things spread in a quick timeframe. Marketing’s task is to determine what is interesting and unique about an AEC firm and then communicate it. The proliferation of websites, apps and marketing automation tools makes this easier than ever. Involvement in social media efforts leads to brand building and establishing thought leadership. In the AEC industry, expertise, knowledge and reputation are critical for success. These new marketing tools provide a means for establishing thought leadership that can be used to differentiate position and communicate a firm’s capabilities and offerings. AEC firms must view social media as an extension of their brand. The same rules and guidelines used for offline efforts should apply to content published via social media channels. To continue to give visitors a compelling reason to visit and use your websites and social outlets, content must be continually updated and refreshed. Tools should be provided that will be useful to your visitors (i.e., technical resources, articles, guides, etc.). Other key components of your web strategy should be to leverage web tools such as blogs, mobile apps, responsive web design, syndication, e-news and social networking to promote AEC firms and enhance your online presence. The media landscape will continue to change and will become more complex. Technology has become much more dynamic and interconnected. The time to implement social media techniques is now, since people are going to talk about your company regardless of whether you choose to participate. The more you know and can manage, the better you are able to listen, engage, and influence your online reputation and your overall image. Building Business with Social Media is designed to provide AEC, manufacturing and other business-to-business marketers with a tool to enhance your firm’s online presence and brand through the strategic application of social media tools. We realize that social technologies will continue to evolve and change. By the time this book is published, there will be some new social tool or app that is “all the rave.” We encourage you to discover and explore these tools and technologies, but apply proven integrated marketing strategies.